There are two kinds of myths about Freemasonry: those told about us by others and those we tell about ourselves. And make no mistake about it, we’ve been making up stories about ourselves since day one. Our first chronicler was Dr. James Anderson who composed, or at least compiled our first Book of Constitutions in 1723. Included as a preface was a history of Freemasonry—a gloss of all the manuscript Charges then available. A rather fantastic interpretation by Anderson, it claimed as fact the lineal descent of modern Freemasonry through King Athelstan, King Solomon, and Adam. Thus was our first myth born. To varying degrees, over the following almost two hundred years many freemasons accepted that history and many non-masons assumed that this was in fact Freemasonry’s teachings. Today most freemasons are unsure who Athelstan was and recognize that the Solomon link is legendary. But we’ve created another myth: our Templar heritage. I hesitate to broach the subject as it is controversial with many freemasons convinced that the Templars took refuge in Scotland and either created or entered Freemasonry to hide their own practices and beliefs. John Robinson’s Born in Blood was one of the first to popularize this notion to a modern audience. Christopher Knight and Robert Lomas, who brought us The Hiram Key, and other books, have demonstrated themselves to be excellent self-promoters but woefully deficient as historians and I shan’t refer to them again, but Michael Baigent, who co-authored The Holy Blood and the Holy Grail, among others, is noteworthy in having drawn back from his earlier promotion of the Templar myth. I will only say that Robert Cooper, current curator of the museum of the Grand Lodge of Scotland, who has spent many years researching the subject—studying primary source documents, roaming forgotten graveyards and the like— wrote what I believe to be the definitive debunking of this myth in the 2002 edition of Ars Quatuor Coronatorum. He has also published a book on the topic. It’s not as exciting as Holy Blood but it’s much better history. More recently, the adoption of the blue forget-me-not by Nazi-era freemasons is another myth. The Grand Lodge zur Sonne (Bayreuth) used to have a pin made for delegates to wear to their annual meetings. One particular pin, in 1926, depicted a forget-me-not. Later, in 1934, the Nazis instituted the Winterhilfswerk, which involved youths collecting money on the streets for rearmament. To encourage donations, different pins and badges were given to contributors for them to wear during that collection period. The badge used by the Nazis for the collection made in March 1938 coincidently was the same forget-me-not pin chosen by the freemasons in 1926. There is absolutely no record of the pin, or the flower, ever having been worn during the war anywhere in Germany much less in concentration camps, as the legend would have it. The Grand Master of the United Grand Lodge of Germany, Dr. Theodor Vogel distributed the same pin as a token of friendship whenever he made official visits abroad after 1948; most notably at a Conference of Grand Masters in Washington, DC in February 1953, where he recounted the 1938 history. This explains how the blue forget-me-not became a German masonic emblem after the war and why, when American freemasons later founded military lodges in Germany, at least one chose that flower as the lodge name. Many lodges in Germany, at least up until recently, present a forget-me-not to newly raised brethren or Master Masons. Some of you may not be aware that our current three degree system has not been the practice from what we style “time immemorial.” Prior to 1737, with the publication of Masonry Dissected by Samuel Pritchard, we only have records of two degrees. For some years earlier the Hiramic legend does not appear to have been as popular as a similar story involving Noah and his sons. As brethren in this jurisdiction are very aware, there is more than one ritual worked. None of them have come down to us from time immemorial. To say that prohibitions regarding innovations in the work is a landmark, is a myth. It is also a myth to claim that A.L. is an abbreviation for Anno Lucis. The earliest mention of ‘Anno Lucis’ in England is in 1777. The initials can be found as early as in 1725, and frequently in the years afterwards. But it does not follow that these letters stood for ‘Anno Lucls’. In both the first and second editions of our Constitutions (printed in 1723 and 1738 respectively), the author uses the English phrase ‘Year of Masonry’. There are jewels extant inscribed ‘Anno Lat. 5732’. The abbreviation ‘Lat’ almost certainly stands for ‘Latomorum' , the genitive plural case of the Latin word 'Latomus' (or in its more usual form 'Lautomus') itself derived from Greek, and means ‘of stone-cutters’. First seen in 14th-century Fabric Rolls it came to represent ‘of freemasons’. Thus ‘Anno Latomorum’ can be read as ‘in the Year of Freemasons’ and, not unreasonably, ‘of Freemasonry’. The abbreviation ‘AL.’ can apply also to ‘Anno Lithotomorum,’ which is found in 1735 in the Minutes of a lodge at Salisbury. The prefix ‘litho’derives from the Greek and the full word again means ‘the Year of Masonry’. In 1752 we have the first List of lodges published by the Grand Lodge of the Antients and engraved by Ellis. He uses ‘Anno Lap’. This could safely be assumed to mean ‘Anno Lapidariorum’ ‘in the Year of the Stonecutters’ and, by definition, ‘of Freemasonry’. Myths are not restricted to Freemasonry. The dating of creation was based on a 1650 work by James Ussher, Archbishop of Armagh, who gives the date of the Nativity as “Anno Mundi” 4004, i.e., 4,004 years after the Creation of the World. To this day there are geography texts that —to poke fun at creationism—report that Ussher “declared that the Creation had occurred on October 26, 4004 B.C., at 9:00 am” This is a myth. In fact, the Irish Archbishop, James Ussher, claimed that the world was created on Sunday, October 23rd, 4004, beginning at sunset of the 22nd. Eight years earlier, in 1642, Dr. John Lightfoot wrote that man was created at 9:00 am. But neither of them gave a precise hour for the creation of the earth. A minor point but still an error that has no place in scholastic textbooks. We can be our own worst enemies. We create these immense lists of famous freemasons, sometimes on the shakiest of evidence, and then expect non-masons not to jump to the conclusion that Freemasonry has had a rôle in creating the United States, or instigating the French Revolution, or trying to control the world. We can’t have it both ways. Fifteen presidents of the United States were freemasons; not most, not all. Eight freemasons out of 56 signators to the USA Declaration of Independence (1776) were freemasons; not most, not all. Nine freemasons out of 40 signators to the USA Constitution (1789) were freemasons; not most, not all. Closer to home, I’ve heard it said that most, if not all of our provincial premiers up until W.A.C. Bennett were freemasons. In fact, of the thirty-four premiers since B.C. joined Confederation in 1871 — thirteen of them were freemasons. For the record, Louis Armstrong, Lord Baden-Powell, Captain James Cook, Carroll O'Conner, James Smithson, Sir Richard Steele, Bram Stoker, Emanuel Swedenborg, Richard Wagner and H.G. Wells were not freemasons. You may have heard that Sean Connery or Robert Plant were freemasons. They are not. It’s interesting how these stories get started. An anti-mason who also had a strong dislike for the Rev. Billy Graham claimed Graham to be a freemason in an early newsgroup posting. A well-meaning but naïve brother read this posting, had a positive impression of Graham and included his name on a list of famous freemasons. It took years to straighten out the mistake and you will still find references online to Graham being a freemason. He is not. Seven years after non-mason Sir Richard Steele died, his picture turns up on a list of English masonic lodges published in Paris. Fourteen years after his death, Albert Pike was falsely claimed to have been the founder of the Ku Klux Klan. The list goes on. In general, those who “blame” Freemasonry for causing the French Revolution are more interested in blaming Freemasonry for the bloody Terror, than in crediting Freemasonry for creating a system of representational democracy. The French Revolution was a complex process in which freemasons played a rôle, but to assign Freemasonry, as a body, a controlling rôle in the Revolution displays a simplistic and unrealistic view of the history of the period. Was Jack the Ripper a freemason or part of a masonic cover-up? The Royal Conspiracy theory was first floated in 1960 and given publicity by a hoax concocted by Joseph Sickert, the son of the famous artist Walter Sickert in 1973. Although Sir Charles Warren was a freemason, the Marquess of Salisbury, Sir William Gull and Sir Robert Anderson were not. Is the eye and pyramid a masonic symbol? No. Of the four men involved in designing the USA seal in 1776, only Benjamin Franklin was a freemason, and he contributed nothing of a masonic nature to the committee’s proposed design for a seal. The committeemen were Benjamin Franklin, Thomas Jefferson, and John Adams, with Pierre Du Simitiere as artist and consultant. 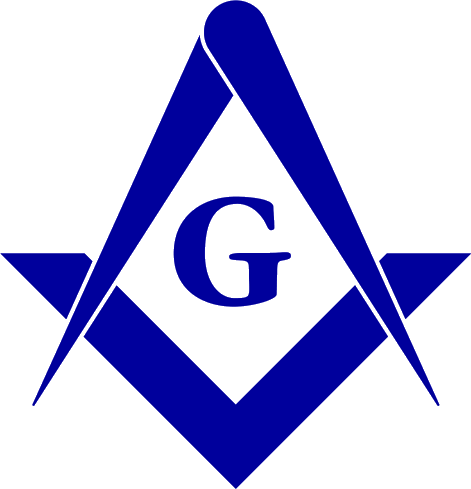 Du Simitiere, the committee’s consultant, and a non-mason, contributed the eye of providence in a triangle. Congress declined the first committee's suggestions as well as those of its 1780 committee. Francis Hopkinson, consultant to the second (1782) committee, used an unfinished pyramid in his design. Charles Thomson, Secretary of Congress, and William Barton, artist and consultant, borrowed from earlier designs and sketched what at length became the United States Seal. None of the final designers of the seal—William Baron, Charles Thomson, Sir John Prestwick—were freemasons. The first “official” use and definition of the all-seeing eye as a masonic symbol seems to have come in 1797 with The Freemasons Monitor of Thomas Smith Webb—14 years after Congress adopted the design for the Seal: The eye inside of an equilateral triangle, point up or down, has often appeared in Christian art. The combining of the eye of providence overlooking an unfinished pyramid is a uniquely American, not masonic, icon. There are no available records showing the all-seeing eye, with or without a pyramid, associated with freemasonry prior to the last century. Many masonic myths are started by anti-masons. Many of them you may have never heard of since they only circulate in anti-masonic circles. George Washington did not renounce Freemasonry. This hoax got its start in 1837—38 years after Washington’s death—with the publication of a tract by Joseph Ritner, Governor of Pennsylvania. Easily debunked, it was reprinted by E. A. Cook & Co., Chicago, in 1877, and republished well into the twentieth century by the National Christian Association. John F. Kennedy did not criticize Freemasonry. He did say, “The very word ‘secrecy’ is repugnant in a free and open society; and we are as a people inherently and historically opposed to secret societies, to secret oaths and to secret proceedings.” Given to a gathering of newspaper publishers on 27 April, 1961, the full text, available from the Kennedy Library in Massachusetts, shows that, in context, Kennedy was criticizing the American Central Intelligence Agency (CIA). Freemasons did not found the Nazi party although one of the founders of the Thule Gesellschaft, in 1918, Rudolf Sebottendorff, was a freemason in Turkey. Maybe. So there you have a few myths. Some do us no harm and, when recognized as myths, can assist us in defining ourselves. Others can do us much harm. What is required in all cases is intellectual honesty and open debate. And knowledge. That is what Freemasonry, to me, is all about.